The TTC Board will meet on January 28, 2014. Here is a review of the major items on the agenda. This report was important enough that it has an article of its own. The CEO’s Report includes more-or-less final numbers for the system for 2013. The TTC was hoping to see 528-million rides in 2013, but only achieved 525m mainly thanks to severe weather events. Although fare revenue is lower than expected (by about $11m, partly offset by income of other revenue), expenses show an even greater saving. This results in a $7.3m “surplus” for the year. This is subsidy that was planned for but not required. The details are on pages 25-26 of the report. The Capital Budget is underspent by about $500m mainly due to slippage on major contracts and deferral of some work from 2013 to 2014. This is mostly not a saving, only a difference in the timing of expenses versus original projections. The date for resumption of streetcar service south of King is once again reported as June 22, 2014, not the earlier March 30 date that had been projected. I will check on this with both TTC and Waterfront Toronto. Very cold weather has slowed construction, but it is unclear why and end of March date is impossible for service to Queen’s Quay. Despite suggestions by Chair Stintz at a previous Board meeting that there was a “commitment” for substantial completion of the Presto project in time for the Pan Am Games in 2015, it is clear that this will not occur. Presto will roll out in stages beginning with the new streetcars later in 2014. The TTC had planned to publish new measures of service quality late in 2013, but these are not yet ready and will be rolled out sometime in 2014. This process is intended not only to better reflect the conditions seen by riders, but to identify routes and locations where existing operations, including the schedules, do not fit with typical conditions. 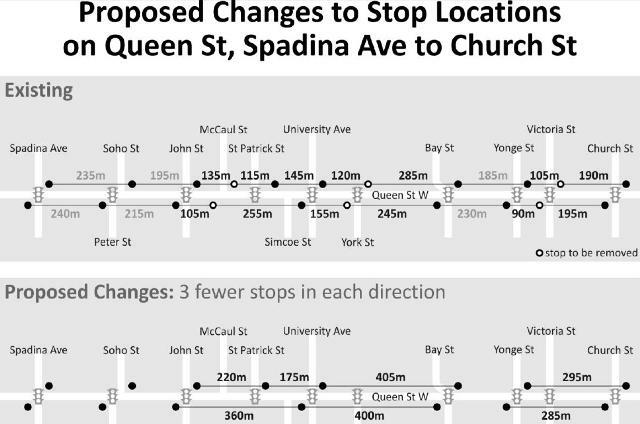 The TTC proposes to rationalize the placement of stops with the goal of making streetcar stops safer, and reducing the need for vehicles to stop frequently at closely-spaced stops. The report includes an illustration of a “before and after” on Queen from Church to John. This scheme eliminates stops both ways at Victoria on the grounds that these are in a short distance of Church and Yonge Streets. The TTC seems unconcerned or unaware that these stops also serve St. Michael’s Hospital. At York Street, the stops are eliminated both ways because they are close to University Avenue. One major problem at York, as at other locations where stops are at traffic signals, is that this location does not have transit priority, and a streetcar stopping for passengers will almost certainly be held by the traffic signal, usually for more time than the actual stop service itself. At Simcoe westbound, the stop will be shifted to the traffic signal at St. Patrick. The stops both ways at McCaul will be dropped. Why the TTC could not include an eastbound stop at St. Patrick is a mystery. This entire exercise has a feel of blindly following a supposed philosophy without looking closely at the details. With luck, pushback from Councillors in affected areas will bring some sense to the process. If the TTC were really serious about speeding transit trips, they would far more aggressively pursue transit priority at the many locations where it has never been installed or activated, where it has been shut off, or where it operates only at limited times of the day. To the discussion of dropping the Don Mills station. I’m wondering if the assumption that people only use that stop as a way station on the way downtown is backed up by any stats. Otherwise, why do something to encourage GO use? That and the area is one of the more densely populated parts of North York. Steve: I think anyone who serious made such a proposal has limited familiarity with the function of that station as an interchange and as the local stop for developments at Don Mills and Sheppard. What really matters is where [are] the bus stops, not the shape of the curb. Why can’t the bus stop just be moved to be immediately before or after the lay-by? This could even mean just putting the front door of the bus immediately after the lay-by so people exiting by the back door would step down into the lay-by. Alternately, the lay-by could be painted out. There might be some locations where neither of these would work. Of course, if the mayor happened to see a bus stopping near a lay-by but not using it he would probably see red. But if car drivers actually obeyed the requirement to yield to buses when they try to leave then lay-by elimination would not be needed, so I have little sympathy. Steve: Buses generally do not stop in locations forcing people to step down to the roadway, but to curb height. It’s a long way down. This would be particularly unsafe in bad weather. 1) It is a mid-block stop and on the north side is actually as inconvenient as it could be: if you are trying to access the church on the south side wouldn’t you rather be at the light? And if you are accessing the community centre the adjacent stops actually serve just as well. 2) The bus drivers ignore it anyways (if you ring for it, they still drive to the next regular stop). I believe that there is merit in having transit stops 300-400 metres apart as a rule of thumb. Jarrett Walker in his book and website ‘Human Transit’ gives a good justification for such a policy. However, I also believe the ‘principles’ TTC Staff have proposed are used to justify what they wanted to do all along in the first place and nothing to do with improving transit times. The principle should be that low usage stops, except when there is not another stop within 400 metres, should be eliminated. The proposed principles means that they can eliminate a high usage stop simply because there is a relatively close stop nearby and though a crosswalk is marked, there is no electric traffic signal. In such a situation it seems to me a signal should be put in, but don’t eliminate the stop. Yes, the LRT should be started at Leslie, so that this becomes a subway/GO/LRT transfer hub. The existing poor TTC/GO transfer should be improved to make it fast, easy and convenient. I am certainly not suggesting that GO can possibly remove the need for DRL. We need DRL. However, most planning for DRL has it terminating no further north than Eglinton. There are very good reasons for this logical termination point. The Eglinton LRT and other local services provide good feeders into it. Any further north and we get into areas of too low demand to justify subway. This is why using the GO train to take demand from Sheppard and points north with the Sheppard LRT feeding the GO train at Leslie Station works well. And the GO technology is appropriate for the longer distances involved. In other words, it is not an either/or. It is a both/and, with the appropriate technology being used to support the appropriate distances and level of passenger demand. There’s a small matter of removing the platform at two stations and changing the track gauge from 1495mm to 1435mm so the LRT can travel to Leslie. The proposed SUBWAY – LRT connection at Don Mills would have the LRT rise up to subway platform level extended further east to accommodate the transfer. Would this be possible at Leslie? If we’re going to change the design of one station, we may as well reconsider the entire Sheppard line and make the LRT that it should be. Unfortunately the subway would still need to go to Don Mills to use the crossover. I cannot see the extra expense would be justified for a connection that would only be made once every 15 minutes with current GO technologies, and the chances of improving their technology are slim to none. The Sheppard Subway was a dumb idea that cannot be justified but if there isn’t a way to convert it to LRT, and the clearances are very tight for the LRT equipment on order, then it is a problem we have to live with. I cannot imagine an existing subway being abandoned no matter how compelling the reason. In order to add enough capacity to the GO line to make a dent in transfers to Yonge you would need to run a lot heavier service to Gormley or where ever the new terminus will be or else institute a local service from Oriole or Cummer to Union; neither one is likely to happen because of cost. Despite what people may wish for GO does not have the ability or capacity to make much of an impact on demand in the 416 except for the outer edges of Scarborough. That is the nature of the model that Metrolinx is using. With a better type of service that could ignore FRA, TC rules and a better design of Union Station they could do it but I don’t hold my breath that it will happen in the next 25 years. What you say makes sense with a very different operating paradigm. I don’t think Metrolinx is capable of implementing one. There are so many stupid stops in the east end that can be yoinked. Regular service stop at the north lot under the bridge at Kennedy station. It’s beyond pointless given the entrance to the station is 50m south of the stop through a walkable parking lot. Nobody ever uses it and its a mystery as to why it is even there. The Sunday stop outside warden station. NOBODY uses it and there are no buses that pass by there prior to the subway opening on Sundays. Regular service on Sunday has no need to stop there given its directly outside the station (its out front of the warden exit). What good is a sunday stop if there are no buses to stop there? Steve: The issue is not to find stops that can be deleted just because you think nobody uses them (and therefore they pose no source of delay to operations), but to shift or eliminate stops where this could speed up service (a dubious claim given many other sources of delay) or improve safety (only applies to streetcars). I too read Human Transit and see a whole lot of merit in the “aim for 400m” stop spacing for surface transit. However, that rule of thumb works best for the main audience Jarrett has – cities like Auckland, Omaha, San Diego… I don’t think there’s a chapter in Human Transit about what happens when you’re running 20 surface vehicles/hour on a line and every vehicle is full. As Steve has pointed out, there’s not much point in eliminating stops if there is a light anyway and if the added demand at the “next” stop pushes loading time beyond one traffic cycle. Take Yonge & College – I bike by there very day and used to wonder why there isn’t a streetcar island there like there is at Bay. It must be because the demand is too high and the overflow of waiting passengers would spill onto the road especially when a full car pulls up. An arbitrary stop spacing distance in the very core doesn’t make sense – not through intersections where pedestrians are the dominant mode. Spacing stops out could work well on lines outside the core, however at the heart of the streetcar network it isn’t stop spacing per se, it’s mainly other things that get in the way – signals, congestion, and illegally stopped traffic. I can’t tell you how many times I’ve seen an entire cycle of King street traffic backed up at Jarvis because of southbound motorists jammed up in the intersection. If the goal is to improve connection between Sheppard LRT and Union station, then it is far more beneficial to enhance GO service on the Uxbridge sub, and locate the hub at Agincourt station. Frequent service on the Uxbridge sub will dramatically reduce travel times from anywhere east of Kennedy to downtown, likely by 20 min or more each way. Even some riders boarding west of Kennedy, instead of going west to Yonge, may start traveling east to Agincourt and taking a GO train to Union. So, seriously, who has to be replaced in order to get actual priority at traffic lights for streetcars? I don’t think it’s someone in the TTC. Someone in the streets department, surely? People sometimes seem to conflate “stop spacing” with “distance to walk to a stop”. They are not the same. I have a 450m walk straight up my street just to get to Lake Shore Blvd. This is okay; I don’t expect a subway station on my street. But once I get to Lake Shore, I am not really keen on walking some fair distance further, especially when the streetcar that I could have caught at my now-vanished stop trundles by because only Ben Johnson would be able to sprint to the next stop to catch it. This is exactly why the average stop spacing on Lake Shore from First St. west to the loop averages just over every two blocks. Many people have a significant walk just to get to Lake Shore. Now that the TTC is providing me with the additional exercise of walking to the 37th St. stop, my total distance from the front door to the stop is 750m. By the time I have simply walked to the nearest stop, I could have gotten in my car and driven to any number of useful destinations already. Anyone who thinks that transit can compete with the car on speed, taking into account the time to walk to a stop and wait for the streetcar, bus, or subway to arrive, is dreaming. The additional stop spacing will do nothing to speed up service. However, it makes taking the TTC less convenient. (Still) slower than a car, and now less convenient is not a good approach. By the way, I was also a regular user of the westbound Victoria St. stop. It let me get on the streetcar with a token (can’t use all door boarding) and make it to the very back of the streetcar where there was always some room, before all the hordes blocked the aisle at Yonge. Traffic is often backed up east of Yonge. Removing the Victoria stop won’t result in significant time savings. In addition, has anyone mentioned that, according to TTC’s current policy, all streetcars must come to a complete stop, eastbound and westbound, both at Victoria and McCaul [on Queen, because of facing point switches]? Why remove the stop? Finally, I have to laugh at the TTC’s assertion that even bus stops should be at traffic lights or crosswalks. That would result in exactly one intermediate stop on the 123 Shorncliffe buses between Dundas/Shorncliffe and East Mall/North Queen, a distance of 2 km. On the 110A/B Islington South, there would be exactly one intermediate stop between Islington/Judson and Horner/Thirtieth, a distance of 2.6 km. For anyone not familiar with the area, there are a lot of stops that are not on traffic lights or crosswalks. Will the TTC remove these as well? The concept of a streetcar stopping in the left lane is one which unfortunately generates the perception of being the cause of a substantial slowdown of traffic. To the drivers who enjoy accelerating at full throttle only to slam on the brakes at the next red light, this is undoubtedly frustrating, although of little consequence to their overall commute time. Further, these people have the right to vote just like the rest of us, and given the right set of political agendas, as is very clear with our current municipal administration, sensible plans based on real fact are not always considered when making decisions on transit philosophy. Like it or not, the preservation of surface rail transit to a certain extent depends on improving the current perception of streetcars as a delay to traffic, and eliminating some intermediate stops arguably has favourable potential to improve this perception. The coincidence of the proposal to eliminate streetcar stops with the upcoming introduction of the new streetcars is not surprising, and is no doubt motivated to a certain extent by the larger size and new proposed fare systems. There is no single simple solution to improving traffic in the city; if there was, it would have been done already, and there will always be consequences, good and bad, to change. One might perhaps make an argument of fairness with respect to stop elimination. By eliminating some stops, and repositioning others, one improves the standard deviation on existing average stop spacing. I do sympathize with people who are mobility impaired, and the philosophy of eliminating stops in the interest of fairness should be weighed against the additional hardship for those with mobility impairments. However one thing in life is very apparent: To most people where a change is proposed which has a negative consequence, an objection is likely. This is understandable but does not necessarily reflect what is best for the collective good. On a more practical level, I do believe an argument can be made for the gradual redesign and reconstruction of intersections, taking into consideration current design standards for sidewalk widths, on-street parking, and the opportunity to construct median streetcar platforms. If the design widths can be acceptably reduced, these platforms result in a perceivable improvement in traffic flow, and may help to quell the anti-streetcar proponents. This may perhaps have a bigger impact on traffic flow than stop elimination, but on this subject I am not an expert. What really matters is where [are] the bus stops, not the shape of the curb. Why can’t the bus stop just be moved to be immediately before or after the lay-by? In a lot of areas, the area immediately before a lay-by is a concrete bordered sheet of grass. You can’t have passengers stepping out on to a grass boulevard because it isn’t always safe. I think it would also run afoul of accessibility guidelines. If the goal is to improve connection between Sheppard LRT and Union station, then it is far more beneficial to enhance GO service on the Uxbridge sub, and locate the hub at Agincourt station. This would make a good transfer point, if the LRT stop were designed for it. In their design, they were planning side platforms with an exit at the west end where the traffic light is, which would make for quite a walk to the GO station entrance through the parking lot. A centre platform could provide direct access between the LRT platform and the GO platform and would make this connection easier. Sadly, the way the underpass was built may preclude using a centre platform. Side platforms could still be used for direct access, but would be more costly. Yes, the grass would soon become mud. Not good. But in a case where that is the only problem, it would typically be much cheaper to pave a few squares with concrete than to completely remove the lay-by. As I said, my idea won’t work at every lay-by but in at least some locations it should be possible to discontinue use of the lay-by for significantly less expenditure than that required for full removal. Steve: The difference must come at the political level. With a Mayor for whom Nirvanna is a street designed only for cars, the message from the top is not exactly high priority for buses and streetcars. New Council, new Mayor, new priorities, maybe. Today I, along with several other residents, was almost run over by skidding cars while waiting to catch the street car eastbound at Lake Shore and Legion in Mimico, around 11 am. This newly reconstructed platform is on a curving section of Lake Shore, with one lane of eastbound traffic over the street car tracks, the other between the platform and the curb. A car on the streetcar lane skidding on the bend in the road can easily jump the platform curb and mow down waiting TTC customers. I noted that this was potentially a very dangerous streetcar stop when I moved to Mimico in late September, but since the platform was reconstructed in the fall, it has become even more dangerous, due to its being widened and the traffic lanes being so narrow. Today fully confirmed my earlier fears. I strongly recommend that this stop be liquidated in both directions. I would recommend also removing the platforms at Park Lawn and replacing both stops with a single stop both ways midway between Legion and Park Lawn. The westbound platform at Park Lawn is immediately west of Park Lawn, and makes right hand turns from Park Lawn to Lakeshore tricky. This is a very busy intersection, and putting a streetcar stop there is not wise when it is not a major transfer point. The distances between the existing Park Lawn, Legion and Louisa stops are quite short. A new stop could be installed some distance east of Park Lawn, since there is massive new development happening there and there is a long distance to the existing next stop east of Park Lawn. Perhaps the developers may be able to help defray costs. The Route 145 Express bus stops are differently and safely located. I would like to here thank you for your efforts on behalf of Mimico residents in implementing and keeping this service, which I use quite often. I would also recommend reducing the speed limit to 40 km/h between Park Lawn and Queen’s Avenue. Speeding cars regularly splash pedestrians on the sidewalks in this area, let alone those of us waiting on the platforms. Lake Shore makes a marked “S” bend around Legion and Louisa, and the roadway over the tracks was really treacherous today. Although the present location of the street car stop is extremely convenient for me, its danger makes it stressful. It is unfortunate that the TTC has made a considerable investment in widening the platform but has made a bad situation more dangerous. Also today I have written to the TTC. The Lake Shore / Legion eastbound street car stop is an accident waiting to happen.